In a previous blog I wrote about collaboration within the academy. I will now touch upon a different type of collaboration, that of co-creation. In contrast to collaboration, co-creation breaches the academic boundaries and encourages researchers to look at the process of knowledge production from alternative and defying perspectives. Co-creation invites researchers to imagine new forms of ethnography (Elliot & Culhane 2017) together with actors outside of the academia. It consists of ‘creative knowledge practices’ (Puwar and Sharma 2012) that are not solely inspired by cognitive knowledge, but that embrace different types of knowledge, such as affective and embodied knowledge. 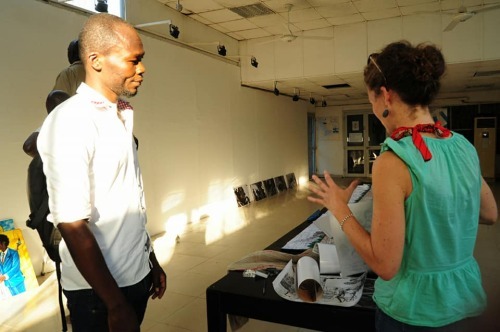 In this blog I will describe the process that brought into being the “Living Under Duress” exhibition that took place at the IFT (Institut Français du Tchad) in N’Djamena (Chad) in October 2017. The purpose is not to describe the theme of the exhibition, the works exhibited, nor the artists’ biographies. 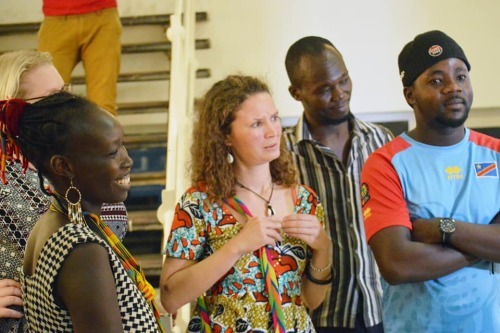 In this blog I will rather shed light on the process of joint curation as an example of co-creation, and an instance of curating anthropology. 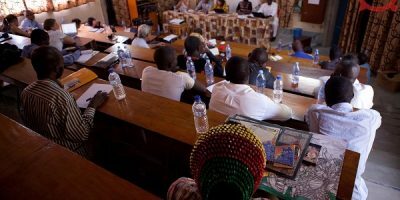 Curating anthropology relates to how anthropological practice can engage with the academy and beyond. Herein, the curator acts as a catalyst who prompts dialogue and exchange. She is a connector and a mediator between artists, researchers, funders and audiences (Puwar and Sharma 2012). The “Living Under Duress” exhibition was part of the CTD final conference. One of the goals of the conference was to combine academic and artistic knowledge production. This is why the exhibition was curated by the Chadian artist Salma Khalil and myself, a researcher linked to a Dutch university. The process was not easy and a couple of challenges had to be surmounted. The first challenge touched upon the theme of the exhibition: ‘duress’ is not an easy concept and we had not had the opportunity to discuss at length about it with all the six artists/researchers that would exhibit their work. I had strong doubts on whether everyone’s work would fit under ‘duress’. In addition to this, I did not even know all the artists. In this sense, it was definitely an experiment. Distance posed a second challenge. I had heard a lot about Salma in the past, but I had never had the chance to meet her in person. At the beginning, our communication was enveloped by confusion and I must admit that at several reprisals I felt frustrated at the process of thinking together with someone who was so far away and with whom I had barely spoken before. Salma and I met the day after I arrived to N’Djamena. The very second I met her, I grew mesmerized by her colourful presence and her engaging aura, all my prejudices and frustrations melted away. We started hanging the works on that Monday afternoon. The boggling with the order, the settings of how to hang it, the choice of the last works,… working together felt like a natural symbiosis, one of us would come up with an idea, the other would complement it and vice versa. We found new parallels among the artists, juggled with different balances in terms of medium, country, colour. We did not agree upon every detail, but there was enough room for adjustment. I guess this a key to co-creation: adjusting. The opening took place on Wednesday evening. I had spent the whole day at the conference and was forced to leave the last arrangements in the hands of Salma. We met at the IFT about an hour before the opening. As I arrived the caterers were decorating the tables with purple bougainvillea roses from the tree outside– the importance of details. The turnout was big and fairly mixed: there were researchers and other conference invitees, the festival artists, IFT workers, there were students, old friends and new acquaintances, members of the Congolese and Central African communities, a few children, journalists,… After our speeches, the visitors commended our words and the artists’ works. It turned out to be a success! There are a couple of important lessons to draw from curating, literally (the exhibition) but also metaphorically (anthropology). The first one relates to flexibility. While at first I felt as if I was lowering the standards of the exhibition, due to the challenges noted above, I grew to realize, at hindsight, that by rolling along with it, I was actually opening the door to unforeseen opportunities and (potential) friendships. 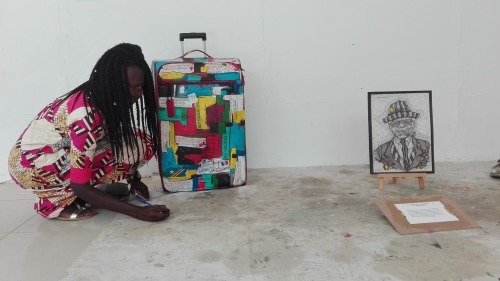 There were, for instance, small surprises during the process, the acoustic rumba sounds that accompanied the opening of the exhibition (thanks to Colby), or Sapin’s art installation born out of looking differently at the suitcase he had used to transport his material. Secondly, and linked to flexibility, there is the question of authority. ‘If knowledge production is to be truly dialogic,’ Puwar and Sharma write, ‘we, as academics need to let go of authority’ (58). In order to open up, we need to dare to let go of intellectual and institutional authority. We need to trust in the capacities of our co-creators, we need to trust that things will work out fine, we need to tune in (not to lower but to adjust) our academic standards in order to make them more inclusive, and, probably, more interesting. Finally, this experience underlines the importance of process above result. At the end, the exhibition was not a result in itself, but rather part of a longer process of collaborations, brainstorming sessions, mistakes, exchanges and practices. Looking towards the future, curating the exhibition has become a stepping stone to new projects and exciting collaborations. Puwar and Sharma refer to this as the call-and-response method, where one practice leads to another. The audience’s reaction led me to consider seriously on the publication of an exhibition catalogue. 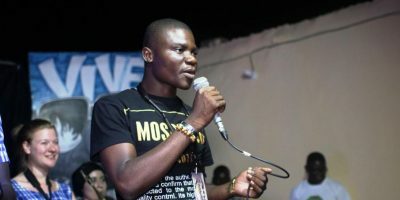 Faithfull, one of the slam artists, was so enthusiastic that he proposed to write slam poetry to accompany the works of art. Imagine a book written by academics and artists that combines poetry, visual arts and academic text. What kind of responses will this generate in turn? We cannot deny we made mistakes, we cannot deny that artists and researchers find it challenging to work together, we cannot deny there were many discrepancies. Our enthusiasm should not blind our mistakes, nor our lack of professionalism. But this is OK, because it is part of a process. On the other hand,we should also not deny that the gains of this project outweigh its shortcomings. One might know where co-creation starts but one surely does not know where it will lead to and when it will end. Such is the open-ended nature of the call-and-response method: we have a new call, awaiting for a response, which will then give birth to new calls and more responses … I am looking forward to the seeds of this co-creative endeavour! Elliott, Denielle, and Dara Culhane, eds. 2017. A Different Kind of Ethnography: Imaginative Practices and Creative Methodologies. University of Toronto Press. Puwar, Nirmal, and Sanjay Sharma. 2012. “Curating Sociology.” The Sociological Review 60 (1_suppl):40–63. I would first like to thank Prof. Mirjam de Bruijn for making this possible. Then I would like to thank Salma for her energy and being a great co-curator, as well as the six artists: Inge Ligtvoet, Sapin Makengele, Salma Khalil (again), Sjoerd Sijsma, Didier Kassaï and Chrisly. I would like to thank my colleagues for their support and thinking along: Jonna Both, Leonor Faber-Jonker and Lucia Ragazzi, as well as Elie Doksala from Crash for his input. My gratitude goes also to the IFT, especially to the dexterous hands of the technical workers. Thanks to Matthias and the catering service and to Colby and his guitarist. I want to finally thank the audience for their enthusiasm!